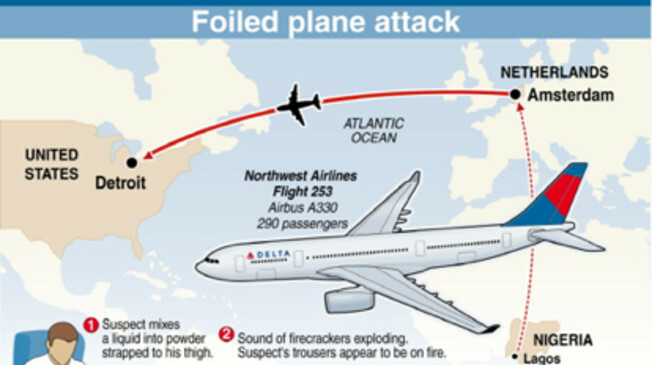 Flight 253, carrying 289 passengers on board, was reaching the last stage of its routine flight from Schiphol airport in Amsterdam, Netherlands to the Metropolitan airport in Romulus, Michigan when suddenly passengers noticed fire, smoke and crackling noises coming from the direction of seat 19A. Concern turned to panic as both passengers and crew members witnessed fire on one of the passenger’s legs and on the wall beside him. One of the passengers moved bravely towards the fire attempting to overpower the man on fire whilst simultaneously trying to extinguish the fire with his hands. Realizing that the fire was a result of a terrorist attack on the plane, fellow passengers and crew members moved in to help apprehend the man from seat 19A. The suicide bomber was then isolated and handcuffed as the fire was extinguished. 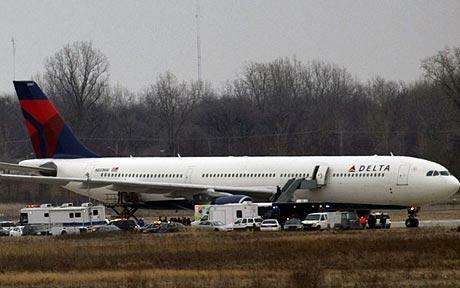 The pilot made an emergency landing at Detroit Metropolitan Airport with the suspected passenger, Umar Farouk Abdulmutallab, being handed over immediately to U.S authorities for further questioning and medical treatment. 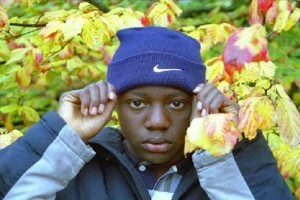 Umar Farouk Abdulmutallab, 23, was born into a rich family in the Muslim district of Nigeria. Described by childhood friends as a devout Muslim, he moved to Yemen at the age of 18 to study Arabic and attend Islamic lectures at Iman University. He then left to study Engineering at University College, London, for 3 years. In July, 2009, he returned to Yemen, where it is claimed that hat he had contact with Islamic extremists and became obsessed with the idea that his destiny was to become a Muslim saint by performing a Jihad act. Abdulmutallab left Lagos, Nigeria on KLM flight 588 to Amsterdam. He then transferred onto Northwest flight 253 from Amsterdam to Michigan on December 25th. The explosive device used by Umar Farouk Abdulmutallab consisted of 80g of PETN, an explosive similar to Nitroglycerine, held in a small plastic bag concealed in his underpants. He intended to detonate this charge with a glycol-based liquid explosive in a plastic syringe which on impact would produce a chemical reaction that would ignite a flame or small explosion and by its power cause the main charge to explode. However, the I.E.D failed to explode causing only a fire that was quickly put out. Had the explosive device worked as planned, it would most likely have caused a hole in the plane’s body thus bringing it down mid-air. On November 19th, 2009, Umar’s father made a report to the U.S embassy in Abuja, Nigeria about his son’s “extreme religious views”. However, the US Counter Terrorism Community failed to fuse together this and other information gathered on Abdulmutallab and he was allowed a US visa. Despite these intelligence failures security staff within the airport could have picked up on some suspicious signs and subjected him to more thorough checks including body search and trace detectors. he had spent time in Yemen, a known hotbed of Islamic extremists.